Someone riding with me in my car yesterday posed a rhetorical question. I’m glad it was rhetorical, though disappointed it was asked with the conspicuous disdain so many carry for the people in their own communities with mental health problems – or in the late stages of drug and alcohol addiction, and the distinguishable toll it places upon their bodies, demeanor – their heart and soul. These are questions people pretend to ask in order to make a statement – remarks about human beings that reflect a pallor of disingenuousness. A ruse against the appearance of fostering a calculated idea. Speaking without the accountability of ownership. Talking dirt without soiling the breath with the stench of their own intention. This is so often how we speak of those left abandoned by a society suffering its own illness. It is trusted that a certain method of inference and euphemism can politely carry our bigotry, racism, classism – any of our “isms” couched in the etiquette of dog whistles – and other finger bowls of mendacity that seat neatly among ingraved place settings and feigned human concern. This woman – dehydrated – gaunt – once vibrant, beautiful and full of optimism. You could see where laugh lines once showcased sparkling eyes … now set in deep hollow pockets under a dull haze of isolation and perceived valuelessness. Hope hanging lusterless and worn as her dark wizened skin. The lack of sympathy my passenger seemed to have for her, I found myself somehow having for him – for his depleted humanity. I guess because I hope I never lose the place in me that sees myself behind her eyes. It is the single awareness I fear I might allow myself to repress. I answered the question he asked of me without really knowing her story. “She had other plans, I can promise you”, I told my passenger, as I pulled up and handed her a bottled water and a five through the window. “What if she buys drugs”, he asked. That is a question I simply ignored. I wonder what any of us would do … with no place we will ever belong. She isn’t huddled in my entryway with an odor of ammonia in musty deteriorating rags. I imagine she finds it better not bathing anymore, but I can’t be sure. She seemed as though she felt safer unapproachable and unloved than she did with someone looking her in the eye – and yet, I know I saw gratitude. That “thank you” for just seeing me. Knowing I am in here …. I don’t know what the answer is. I wish I did. But I made a vow a long time ago – to look every person in the eye – especially when saying no to them, when I can no longer hand another dollar or a five. I believe one thing with my whole heart. If every person were given the basic human dignity of mere acknowledgement … the lives of many would change. But none more than that of those who look at the faces they once avoided – on streets they will never fully know. Summer Solstice arrived again. I sat there stalled… knowing it really was time to clear. Time to recognize my intention and see what I had set it upon. We often think of setting intention without looking at where we left it last … or how far from there it drifted when at long last left unmoored. Intention is always there. We think to consider intent at auspicious and naturally supported times. Times like Solstice, as I am doing now – when the real and the symbolic sunlight leaves less dark for us to hide of ourselves – the parts that are work to see. So we ceremonially look at this shadow side by placing intention that we should see it. While forgetting still, the enormity of intention sustained, in keeping the dark as a place to hide it. We can be in so many places at the same time by intention. Even more still, if we confuse intention with the ideas of “wanting” or “thinking.” Pieces of us hidden in layer upon layer, one underneath the other. If we believe of ourselves that intent is the powerful and creative force aligning purpose with destination – seed with fruition – and that we found it waiting for us whole and unoccupied with no peeling-away or digging-up to find it. Claiming our intention proudly when the universe is working favorably on our behalf… while it carries us to the height from which may actually be our next lesson in falling. Do we simply create another layer to rest ourselves upon until it slips into expanding dark, while our vision like the days run shorter? Intention like solstice can be a cycle for expansion in purpose – or merely a pattern that goes around one more time. A teacher in my life spoke of this near the time my spouse David was preparing for his death – and while I prepared to be here without him. David asked me to see my heart. To see all of it – fully- with the love and compassion that he did. I knew what he meant. 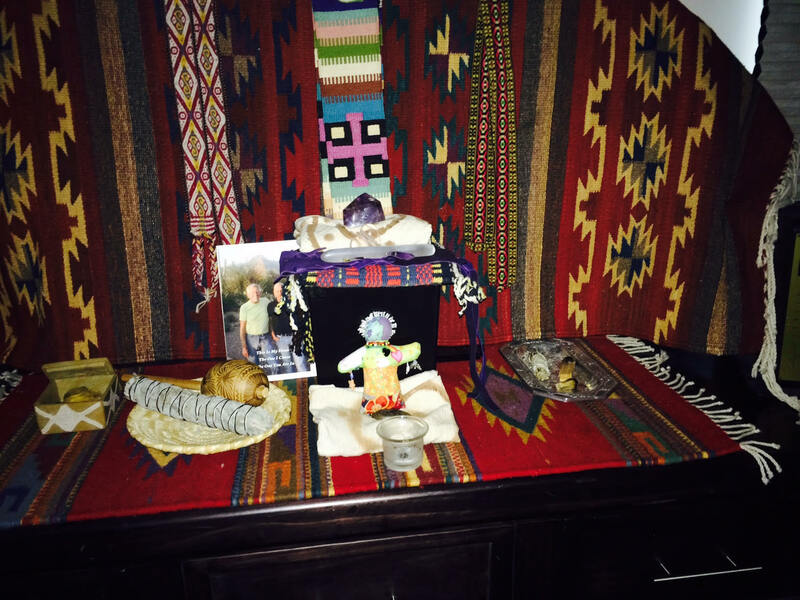 This Mystic I loved and married knew what he sustained in me … and was handing me the reins. Every time I sat in front of him, I knew I was completely naked. At first you want to cover up… hide parts of you. But then you discover how wonderful it is to sit uncovered – to be fully seen in the gaze of eyes not merely unoffended – but even enraptured. I began looking at my naked heart as he did- and feeling to cover parts of it again. I’m alone, and I am uncomfortable sitting naked with myself – and even that truth of myself I kept hidden. It isn’t evil we hide in our hearts… but the secret of how and where we are broken. No sooner had I asked myself to sit naked, than did all I was protecting show of itself. You don’t get to look, find and free yourself just once like in hide and seek. There is no olly-olly-oxen-free for things hidden of our heart. No, this is a broken relationship, if we are not cultivating, caring for and nurturing it by growth. Spiritual seeking – our path to enlightenment – whatever you wish to call it. This pilgrimage holds the same opportunity for us to hide and to seek – equally, discriminately, and thoughtfully unaware. I didn’t catch this minor detail within myself. I could see this among others – as though it were others that haven’t the willingness and fortitude to look fully at themselves – their motives – their shadow. And under this shadow judgment, is where I hid my own. Who would have ever looked there? Not me. I’ve long said- “If you’re lying to yourself, I won’t brand you as lying to me.” To find my own aversions hidden underneath my integrity – genius! But I know I can’t now keep both. You can’t, once seen – not and live powerfully and masterfully in your purpose. Do I keep my aversions or my integrity? A question we all face of ourselves. This is the core of intention. This is where my work begins – perhaps everyone’s. Just as I could only give my whole heart to someone from whom I could not hide parts of it. To be whole, I have to learn to equally acknowledge my light as well as my shadow. This is where my intent belongs – if it is ever to be of service – if it is ever to be undivided. I’ve never felt such a hard and deepening blow as the departure and absence of David from my life. Still, I am unable to use the word ‘loss’, even in the wake of tremendous grief and heartbreak. The gift of David has been too profound … too enormous … too exquisite to use a word like ‘loss’ in describing anything to do with him. It’s impossible to voice the privilege I feel for every minute we’ve shared… every moment of living our lives. I don’t think I really knew this degree of love or the fullness of truly living before David. Certainly not of the intimacy that is possible when we embrace each other, and embrace ourselves. I didn’t know that about intimacy … the part about embracing ourselves. Not until he showed me. Sharing one’s death is no less of a privilege, and certainly no less intimate than sharing one’s life. There wasn’t a single moment that didn’t contain David’s seamless grace. As his energy became less available, David Bruce simply expended it with discernment and reserve for the most important, the most honoring and relevant uses – still giving its proportion freely and purposefully to others. There has been a magic in all of this. The precise people showing up at the precise time for the precise purpose and service … as though he choreographed even the moment of his departure. I almost hesitate to write that part down here. It sounds so …. well, so much the way those things sound. But too many of us sat in awe of that precision and grace for me to wonder if it were only imagined. Magic doesn’t surprise me much anymore. I’ve rather come to expect it. Anyway … David and I both put this video together. He appreciated watching me work on things like this. He liked having me move the photos around and enjoyed the unexpected thoughts and conversation it inspired. David enjoyed seeing the moments we all shared, and also those he shared before me. So this isn’t just something I’m putting up here ….. it’s from David. I added a few additional photos and selected some music for it. He left that up to me. So as much as this slide video is in memory of David – it is equally David’s remembrance to those he loved – and he wanted me to share it with you. David loved seeing you … thinking of you. He viewed this through most of its iterations. Often a number of times. I can tell you this for sure. David loved the people in his life. He loved you …..
My fears lay awake in a lucid dream, the compass for where I stand. Had I the wisdom to depart from this place I don’t belong, the grace wisdom brings ought be present in me, and I would never have found myself here. I did not have that wisdom, nor the grace it affords. My departure here will be clumsy therefore, and things large and small may get broken. But it is no less true, the imperative that I must leave. I found myself on stage. A dim spotlight shining on me. The opening of Khachaturian’s Masquerade, I can hear – and the seats are close to full. I wish so much that I could dance myself away unnoticed. But I’ll loudly stumble off – conspicuously echoed, gruelingly observed. A snickering as a tcht tcht tcht, of tongues in heads moving side to side, and the tightening around my heart that follows. With a ring the music of a waltz begins – Dancers leaping into strides that rise and fall. I will disappear, restore in Nocturne… as the suite spectacularly plays on. In Capriccio I’ll turn back to see why the music sighs – the breathlessness of beauty where grace belongs. I’ll find myself seated among glorious applause, jeweled ovation, my hands in adamant clapping – Fandango, rising as one of the all. I shall never shake my head, though – with a tcht tcht tcht sound for the fool standing the stage alone. I know of his courage, and the onlookers shame – in the surety of ushered velvet seating, house lights, and the numbers only in which, feigned strength is played.